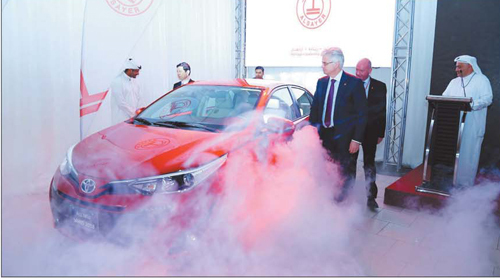 Mohamed Naser ALSAYER & Sons (MNSS), a subsidiary of ALSAYER Holding has unveiled the all-new Yaris 2018 – Packed with Style. The press conference held at Toyota new cars showroom Alrai was attended by Bengt Schultz Chief Operating Officer, Johan Heislitz Senior Business Director MNSS, Stephen Cleary Chief Marketing Officer, Scott McNicol General Manager Sales, Hamad Al-Fouzan Product Planning Manager, Toshiyuki Nakahara Deputy General Manager of Middle East & Central Asia Division and accompanying delegate from Toyota Motor Corporation along with distinguished members of the press and media. 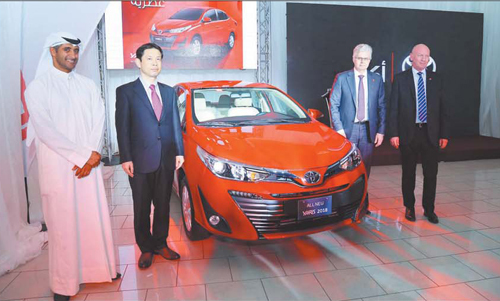 Setting new standards for the compact sedan segment, Toyota announced today the launch of the new exciting and stylish Yaris in the Middle East. Featuring advanced and emotional design and offering superior comfort along with uncompromising blend of quality and durability, the new Yaris delivers a true Toyota experience to reinforce the car’s position in the region’s automotive market. 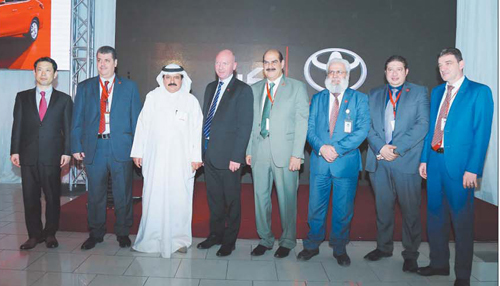 “We are excited to launch the new Yaris in the region and we are confident that it will definitely be at the top of the list for customers when they search for a compact sedan that combines stylish design and ride comfort along with dynamic performance and superior value,” said Yugo Miyamoto, Chief Representative, Middle East and North Africa Representative ?Office, Toyota Motor Corporation. “At Toyota, we always strive to connect with our customers to understand their evolving needs and evaluate dynamics of the market to create ever better cars that will strongly appeal to all customers. Owing to its stylish design, quiet and roomy interior cabin, as well as its powertrain that delivers both dynamic driving performance and fuel economy, the new Yaris will stand out in the region’s highly competitive market. I would like to extend our deepest gratitude to our customers for their constant support and inspiration, which continue to motivate us to develop new cars that exceed their expectations,” Mr. Miyamoto said. The new Yaris demonstrates remarkable attention to detail in the design and engineering of the vehicle encompassing its flashy exterior and class-leading interior design and state-of-the-art passenger cabin to its responsive driving dynamics. The overall length has been increased by 15 mm to 4,425 mm, and the overall width of the vehicle has grown by 30 mm to 1,730 mm. The result is a highly aerodynamic body with a wider and more masculine stance. Cutting-edge design defines the exterior of the new Yaris, with its dynamic angles as well as sharp headlamps with integrated clearance lamps. The front of the new Yaris has been updated with a horizontal grille for a wider yet more aerodynamic appearance. LED daytime running lamps have also been integrated into the shape of the grille for a sleek appearance, while slimmer rear combination taillights adorn the rear of the car with a unique look. From the side, it features a distinct character line that starts from the front wheel arch, heading towards the rear doors, with another line linking the door handles to the rear taillights. The addition of the newly introduced Shark Fin antenna adds to the aerodynamic design of the car. Available in eight distinctive exterior colors of which two have been newly-developed, including Red M.M., and Dark Blue M.M., which expresses a sense of power and elegance, the new Yaris has been rearmed with a newly designed 15-inch alloy wheels. With an exciting interior featuring a distinctive design, and offering convenience and comfort with a layer of luxury, the new car’s cabin owns an exclusive profile. Simulated stitching along the edges from the instrument panel to the front console render a feel of luxury in the interior of the new Yaris. The front cup holders are equipped with an LED shower light, providing a sense of advanced technology. In addition, the central console of the new Yaris has been redesigned to create a greater sense of integration. The cabin has been adorned with a range of enhanced features, including Smart Entry & Start System, Cruise Control System, optitron meter and 4.2-inch Thin Film Transistor (TFT) multi-information display, automatic air conditioning system, as well as a Six-speaker sound system with AUX and USB jacks. The interior is available in two colors, with the Black creating a calm, rich modern interior, and the Ivory making the interior feel even more spacious and sophisticated. Delivering a dynamic driving experience, the new Yaris comes with a 1.5-liter and a 1.3-liter engine alternative. The 1.3-liter four-cylinder engine generates a maximum output of 98 hp and 12.6 kg-m of torque and is mated to either a five-speed manual transmission or a Multidrive 7S advanced seven-speed automatic transmission. On the other hand, the 1.5-liter four-cylinder engine can churn out a maximum output of 105 hp and 14.3 kg-m of torque and is mated to the Multidrive 7S automatic transmision to offer a smooth shifting experience with excellent fuel efficiency. As with any other Toyota model, safety remains a top priority for the new Yaris, which includes a comprehensive array of safety features to protect its occupants, such as seven SRS airbags, Vehicle Stability Control (VSC), Anti-lock Braking System (ABS), Electronic Brake Force Distribution (EBD), Brake Assist (BA), Traction Control (TRC), Hill-start Assist Control (HAC), High Mount Stop Lamp, and an enhanced body and platform structure, among many others.